Silk is increasingly being used as a biomaterial for tissue engineering applications, as well as sutures, due to its unique mechanical and chemical properties. 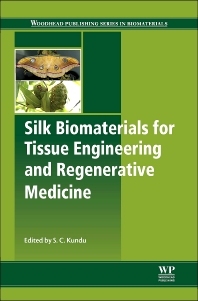 Silk Biomaterials for Tissue Engineering and Regenerative Medicine discusses the properties of silk that make it useful for medical purposes and its applications in this area. Part one introduces silk biomaterials, discussing their fundamentals and how they are processed, and considering different types of silk biomaterials. Part two focuses on the properties and behavior of silk biomaterials and the implications of this for their applications in biomedicine. These chapters focus on topics including biodegradation, bio-response to silk sericin, and capillary growth behavior in porous silk films. Finally, part three discusses the applications of silk biomaterials for tissue engineering, regenerative medicine, and biomedicine, with chapters on the use of silk biomaterials for vertebral, dental, dermal, and cardiac tissue engineering. Silk Biomaterials for Tissue Engineering and Regenerative Medicine is an important resource for materials and tissue engineering scientists, R&D departments in industry and academia, and academics with an interest in the fields of biomaterials and tissue engineering. S. Kundu is a Professor of Biotechnology at the Indian Institute of Technology.